Are you searching for the perfect place to host your wedding ceremony and reception, all in one convenient (and gorgeous!) location? 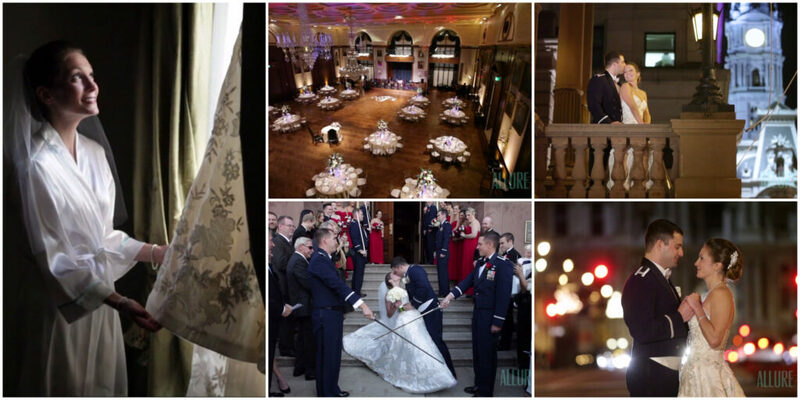 The Ritz Carlton Hotel in Philadelphia just might be the venue of your dreams. 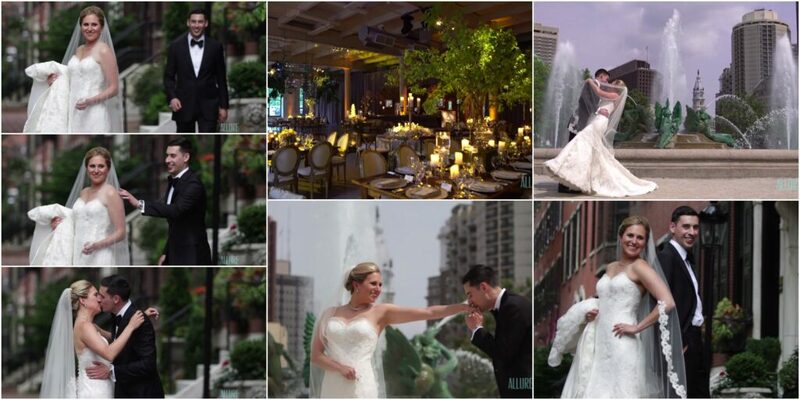 Hillary Gordon and Andy Apfelbaum fell in love with The Ritz’s exquisite Grand Ballroom and perfect location right in the heart of Center City. Just seconds away from City Hall, The Ritz is a celebrated and newly renovated hotel with amazing vistas and beautiful architecture that makes for great backdrops for wedding day photographs. 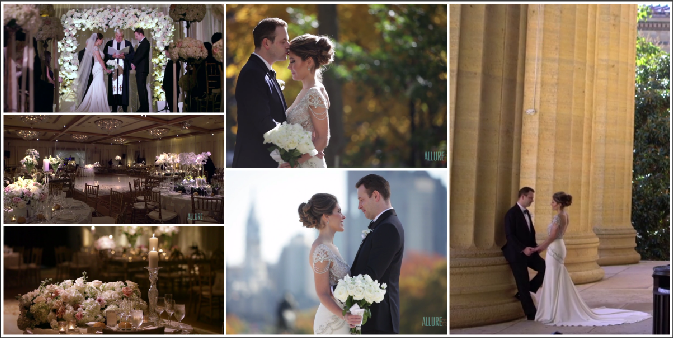 Allure Films was there to record every breathtaking moment during Hillary and Andy’s wedding day. The creative visionaries of the Evantine Design team were responsible for transforming the Grand Ballroom from an intimate and romantic ceremony venue to a beautiful dining and dancing space in an instant. Imagine the guests’ surprise when they stepped out of the Grand Ballroom for cocktail hour, only to be led right back into the same room for the reception which now looked completely different! We loved catching their faces on film as their jaws dropped in amazement. EBE’s Dreamtime took charge of packing the dance floor with the guests and wedding party, including the adorable flower girls and ring bearers. In addition to the celebrated first dance and hora, Allure Films was able to document the traditional Mezinke dance, the crowning ceremony honoring the bride’s parents for marrying off their last child. Congratulations and Mazol Tov Mr. and Mrs. Apfelbaum! Here’s to many more years of love and happiness! From the moment Morgan took her first step down the aisle to meet her future husband, Justin, their wedding felt like something out of a storybook. 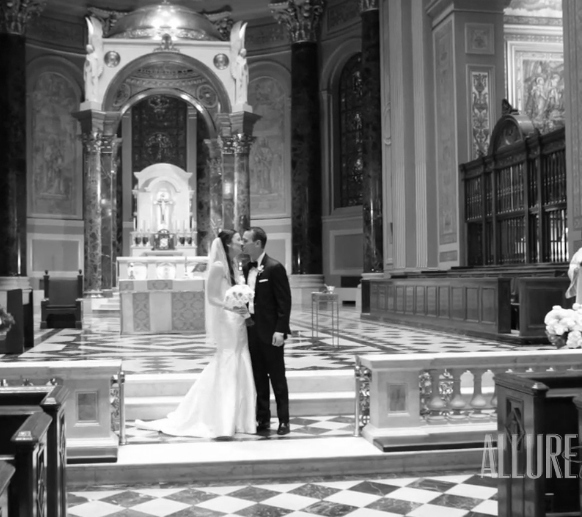 Philadelphia-based wedding planners Lauren James Events played a huge role in helping the bride and groom’s fairytale wedding dreams come to life. After a classic car ride from her childhood home to Fairmount Park, Morgan met Justin under a stunning wrought-iron archway wrapped in flowers and vines. The couple exchanged heartfelt vows to one another in front of their friends and family in the midst of the majestic and whimsical gardens of the Fairmount Park Horticulture Center. After the ceremony, the princess bride and her prince were taken away on a horse-drawn carriage to join their loved ones for a magical evening of celebration. Their reception was held underneath a tent on the Horticulture Center property, filled with violet- and lavender-colored florals designed from the vision of Petah Bashano Event Design. Not only were the decorations stunning, but one decoration in particular was looking especially delicious! The Donut Tree (yes, you read that right!) was definitely a hot spot for photos and satisfying your sweet tooth after the main course. Philip Gabriel Photography captured several great shots around The Donut Tree, as well as countless beautiful moments throughout the evening. When the wedding party and guests weren’t chatting and reminiscing about stories of the bride and groom, they were dancing the night away to the sensational musical performance by The Vincent James Band. Fireworks capped off the magical evening, and Morgan and Justin were caught stealing more than one kiss in the middle of the show! Congratulations to the happy couple, and best wishes for a life of happiness together! 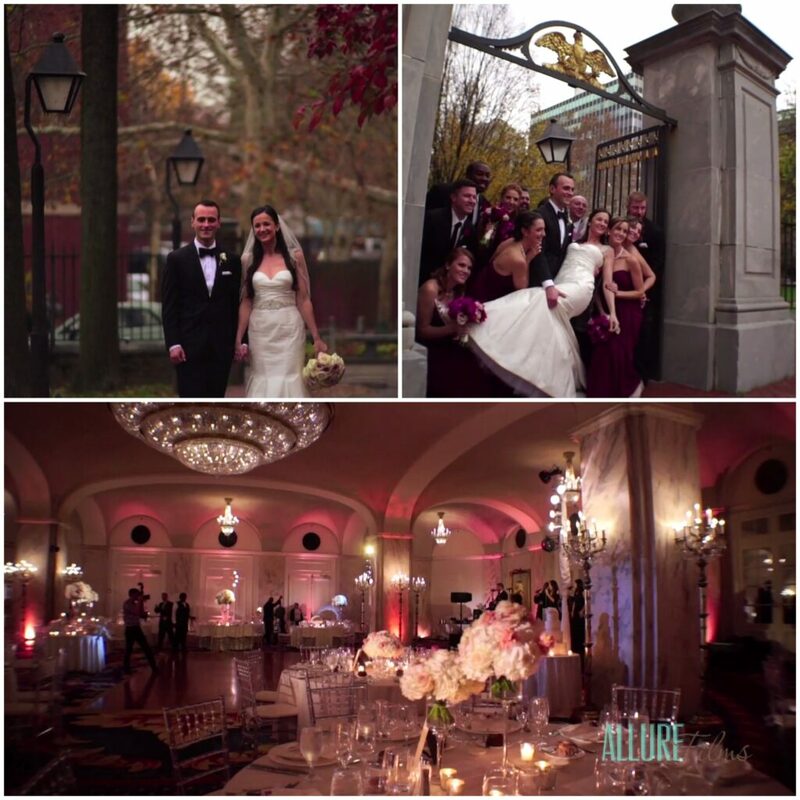 Love & Romance At This Stunning Moulin Philadelphia Wedding! If you’re looking for a jaw-dropping location to host your dream wedding, look no further than Moulin at Sherman Mills! This venue by Brûlée Catering was the perfect place for Laura and Alec’s June wedding. Nestled in East Falls just a stone’s throw away from Center City Philadelphia, had everything the bride and groom could have hoped for, and more! 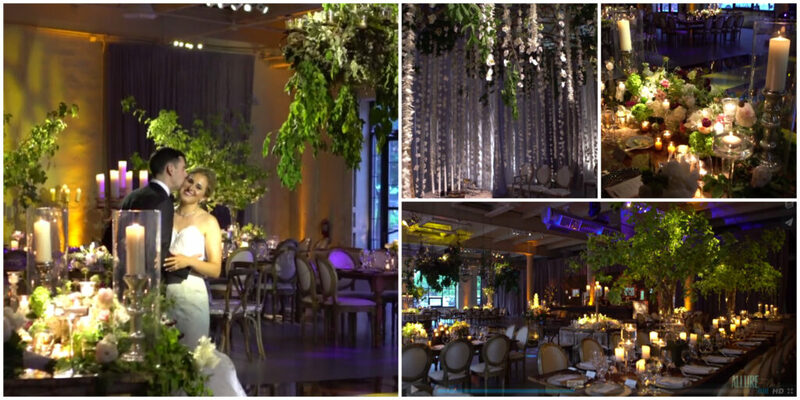 After capturing some very touching footage of their “first look” in the heart of the city, Allure Films traveled with the couple to Sherman Mills, where Evantine Design had draped Moulin’s towering ceilings in hanging greenery and perfect summer colors. Laura and Alec exchanged vows under a chuppah that appeared to be raining flowers on the couple. How romantic! The new Mr. and Mrs. led their guests into the reception hall, where they dined on Brûlée Catering’s award-winning fare and danced the night away to live music by Simply Irresistible. 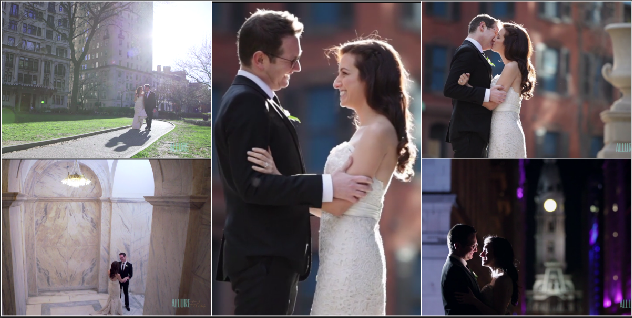 We enjoyed documenting loving moments between Laura and Alec around some of Philadelphia’s hot spots. The historic locations all throughout Philadelphia are definitely an advantage of a city venue. Moulin is definitely a unique venue that will provide a wow factor that just can’t be found anywhere else! 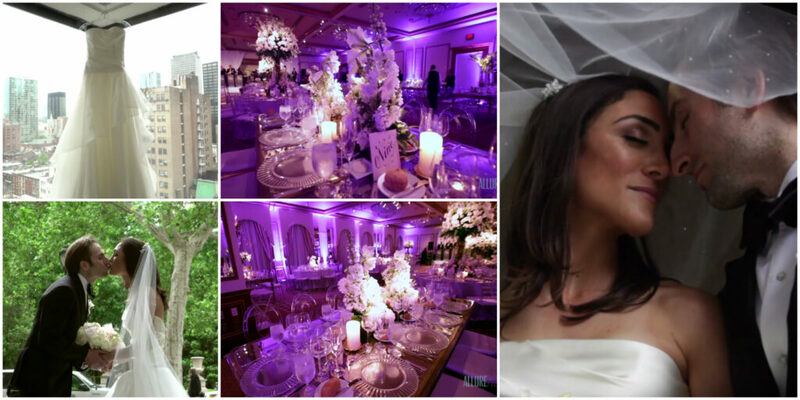 Take a look at this sneak peek video, and start taking notes for your wedding day décor!